Deutsche would have much more to gain from the merger than Commerzbank. It would also be advantageous for Commerzbank, especially in relation to the diversification of franchises and obtaining internal knowledge and products, but to a lesser degree than for its partner. Commerzbank has made significant cuts in the past, while returning to focus slowly on digital technologies, but there remains much to do, with or without a merger. For Deutsche Bank the situation is even worse and its shareholders are again awaiting greater cuts in capacity. This could be achieved more easily with a merger, which is seen as an escape route from the difficult structural position it has been stuck in for years. Many market participants are not much interested in this type of merger (especially among the shareholders), but I wonder what alternative solution they are proposing, given that they do not like the status quo either. Deutsche Bank´s results for the fourth quarter of 2018 were not reassuring. In general, a merger would present some inherent difficulties – but not insuperable – and would be full of uncertainty. But with a wise and patiente leadership, there could be a decent chance of success. The strongest economy in Europe has the right to at least one bank with business and financial characteristics which give tranquillity. The main reason for a merger should be related to the relative complementarity of the business models of both banks, instead f just being a cost cutting game. 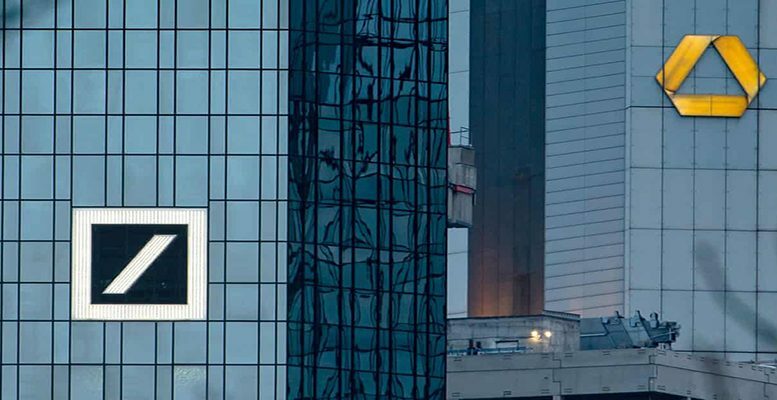 A merger would give Deutsche Bank the possibility of improving its position in the German economic panorama, principally in the SME sector, which is one of the country´s economic pillars. Commerzbank already enjoys a significant market position in this sector, and a merged group would offer a wider range of products and services – principally in wholesale banking and investment – to German SMEs. Deutsche has a wider and deeper client offer in these areas. For Deutsche, a possible merger would signify, ideally, a reduction in its unhealthy dependence on income from global trading operations (where the bank in the past was a “monster of income flows”) and a reorientation towards activities in primary German markets (and other European markets). The merged group would be in a privileged position to become the champion in introducing a wide range of German companies into capital markets and in providing them with consulting services. In this sense, it would be in the vanguard of the current tendency to disintermediate credit in Germany and other European regions. The merger would also allow Deutsche to depend less on the success of Postbank (its major retain bank subsidiary which struggles to be profitable) in strengthening its retail franchise in Germany. Commerzbank has already made major advances in the digital trend, having made major investments in this. If done properly, the merger will lead to the birth of a national champion in Germany – an event that would be welcomed by the German Government – with a proportionally less significant exposure to global trading markets, in which Deutsche is already not as important as before and in which it has little chance of recovering its previous position. Without doubt, increasing profitability would remain a serious challenge, especially in the difficult German market. But the new group, once the effects of the merger had emerged, would at least stop being an untypical group compared to the major European banks with similar business models. An alternative to the merger is that Deutsche continues on its own. However convincing the current management team is in the business reorientation and cost cutting, it is unlikely to be able to direct the bank towards a stringer market position and more reassuring financial fundamentals – above all a greater sustainable profitability – which the investors want and hope one day will be guaranteed. A possible Deutsche Bank cross-border merge would be problematic. In any case, it is unlikely that a major non-German banking group is up to the circumstances. In any case, major European banks like ING, Santander, BNO Paribas and others have already entered the German market in a cheaper and less risky way, although in some cases the profitability remains insufficient. The ECBS´s principal supervisors have pronounced on the benefits of Deutsche being associated with a cross-border merger rather than a national one. But their opinion could be influenced by their objective of increasing the network of cross-border banking groups in the Eurozone, reinforcing even further the reasons for strengthening the participation of the cross-border banking supervisors.